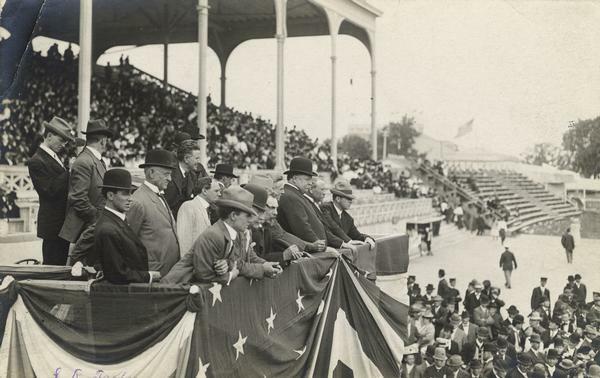 Things sure have changed at the State Fair since it was first held in Janesville in 1851 when it was sponsored by the State Agricultural Society to showcase the state's advances in agricultural machinery and products, attended by about 10,000 people. 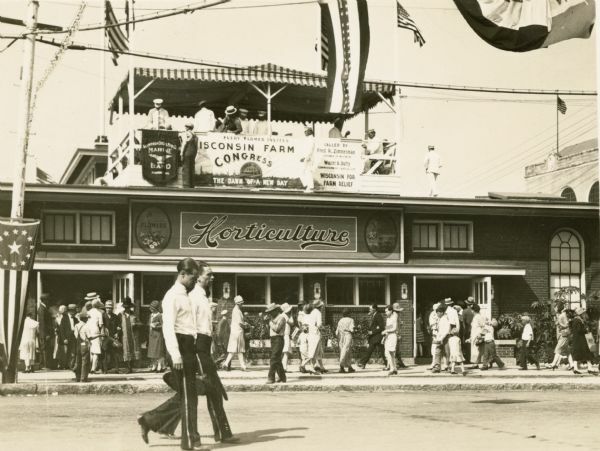 This gallery showcases images of the Wisconsin State Fair, adding up to a collection of over 450 photographs and ephemera. 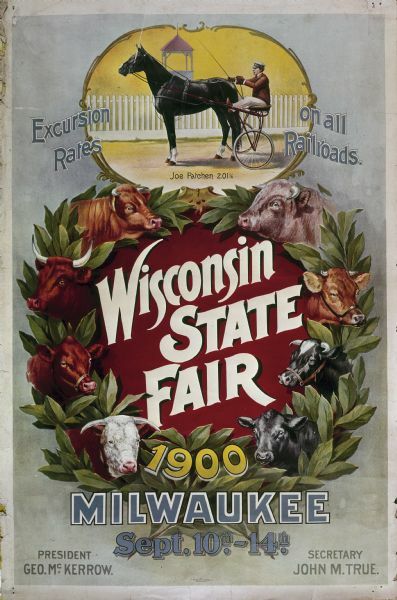 From 1851 to 1885, different cities took turns hosting the fair, including Madison in 1858, 1860, 1867, 1868, 1878 and 1879. 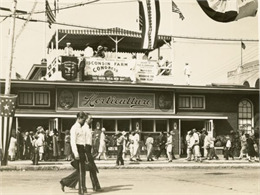 A Milwaukee fairground was the site from 1886 to 1891, and since 1892 the fair's permanent home has been in West Allis. The annual fair has been cancelled only five times: in 1861, 1862 and 1863 during the Civil War, in 1893 when the World's Columbian Exposition was held in Chicago and in 1945 by request of the U.S. Office of War Transportation. In order to attract the public, more and more popular entertainment was added to the standard exhibits of farm machinery, displays of produce, and competitions for prizes for the best farm animals and domestic arts products. This gallery provides highlights of those changes through time, from fire company competitions, horse races, sideshows and brass bands, to auto and motorcycle races, aeronautics shows, demolition derbies, politicians and TV/movie celebrities, Alice in Dairyland and, of course, food and amusement rides. Today the fair is a huge eleven-day event with an attendance of nearly one million, a far cry from its modest beginnings. Robert J. Taylor, Melvin Diemer, Joseph Brown and Sherwin Gillett were among the Wisconsin photographers who attended Wisconsin State Fairs and photographed exhibits, crowds and particular events or animals. Photographers from the University of Wisconsin Photographic Laboratory also attended over the years and pictured events and exhibits.